Plate carrier on a budget. Bear with me on this if you can. But I'm not really 'digging' my current vest. I have a British issue dpm assault vest with a hydration pack. Sure it's functional but it's just not really doing it for me. Last year I ran mk4 osprey with 9 mag pouches, 2 utility, medic pouch, 2 grenade pouches and a camelback. It was great but also a tad heavy. So I am thinking about getting a lighter plate carrier,but my budgets not the biggest. By not the biggest, I would struggle to even dream about the latest Crye, sohpc type carriers. Warrior is just about within reach but in the sense of 3 months saving for a new one without pouches. So I was wondering if anyone had any suggestions for plate carriers on a budget. But not just cheap, also something that will stand up to airsoft and not fall apart mid game and prove to be a false investment. How much is this "budget" of which you speak? TMC JPC plate carrier, I think it cost me £50?. I have the Crye JPC for outdoor and the TMC JPC for indoor and the TMC is not far off on quality! Wait for the WAS 20% off discount and a get a full WAS rig for that price? Or, go used and get a full WAS for less than that. Seriously it'll take a ton of time digging and you need to get in all the facebook groups, on every forum and scour ebay, but it is by far the best thing to do. On a lot of groups and keep missing bargains as they always show up when I'm skint lol. Heck I'm still trying to fix my ics m4 p, but almost on the verge of breaking it up as a spares/boneyard gun. Soo.. where'd the £100 budget go? I mean, if you've got that and you can just keep it aside for a little while, give it a few weeks, some effort and thorough searching (don't stick to just facebook if you have been) and you'll be able to snag something good. Cheers for the advice on vests etc guys. 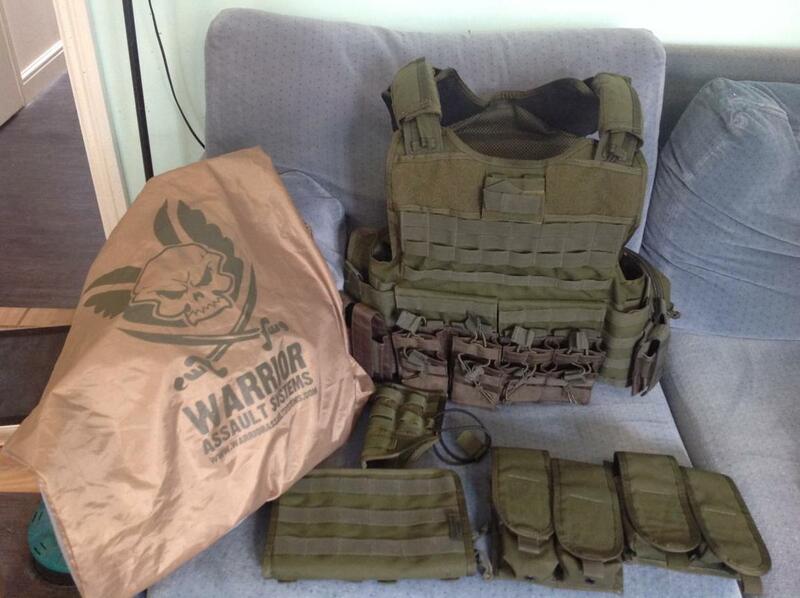 Got lucky on Friday, after posting up about wanting a od green carrier I got a message off a local guy wanting to shift his warrior set up. £50 was the agreed price and I really must say....winning. As far as I can tell it's a warrior raptor, has a hydro pouch, radio pouch, several grenade pouches, medic pouch, 2 double pistol mag pouches, 8 viper single mag bungee pouches, 4 more double mag warrior pouches, a pistol holster and an admin pouch. FairPlay, when hunting pics all I saw were the ri as compact which were vastly different. Didn't notice the other ricas carriers. Still, not going to sniff at the deal lol.